Unlike fitting together pre-cast moulds, free-form construction allows architects the freedom to create progressive designs, especially where one transition merges into another - allowing us to design the park that perfectly meets the requirements of the site, user-group and the local community. • It’s an ideal hard-wearing riding surface and skaters’ and riders’ first choice. • It’s vandal-proof, even under the most severe conditions. • It will not rust, rot, decay, burn, break, or bend, and doesn’t contain loose fixings. • It’s much quieter than steel or wood. • It gives good traction and the least slippery when wet, it also dries the quickest. • Concrete is far more durable and low maintenance than any other skatepark material. And if you don't believe us - ask the users! The proposed site is carefully prepared. 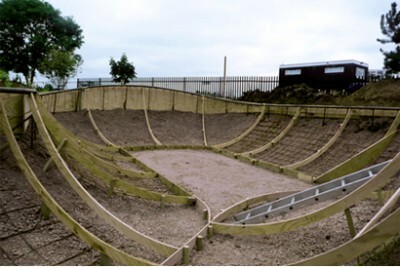 First we excavate or build up the earth, and install drainage, coping and all steel work. The area is then set out with formers and re-bar to shape the material and the concrete is sprayed in place. A pump sprays the concrete onto the transitions using compressed air. We use the ‘sprayed concrete’ method. 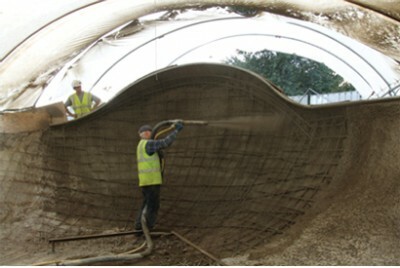 Curved templates and screeds are used to give a high level of accuracy. Finally the surface is hand finished through several passes reducing the size of steel trowels to give a smooth, durable polished surface. 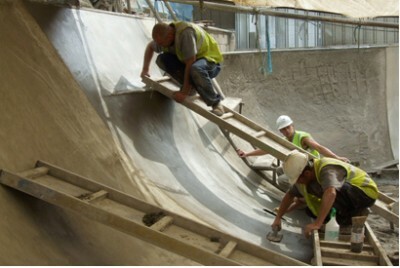 This is the method used by the highest quality skatepark manufactures around the world. “Look at the finish on that! Exclaims Matt Elms, crouching to run his finger along a paper-smooth block of solid concrete with a gleaming stainless-steel edge."